That’s the period when children start to create their personality, and it’s the phase they start making choices, so they experience freedom. 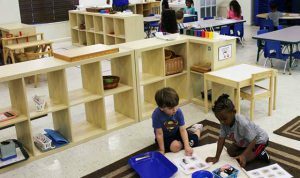 Dr. Maria Montessori developed a child-centered classroom with an individualized learning process for each child. All Montessori materials were developed so each child can learn in their own pace and still have all the knowledge expected by that age such as reading and writing. That’s is the foundation for the Montessori environment, and so children start working in this area since the toddlers’ classroom. Fine motor skills, patience, concentration and care of the environment are the basic elements learned in this area. This area was developed so children can observe details that are usually overlooked. Lessons focus on the distinguishment of colors, shapes, sizes, textures, sounds, and smells. For that reason, children are introduced to this area in the toddlers’ room with more simple activities coming to the next classroom to experience more challenge lessons. Through phonetic sounds, children will develop their early-literacy skills moving to read and also writing. They will start learning the shapes and sounds of each letter and thus merging them to form a word. At this point, they will be reading, and so teachers will need to introduce more and more vocabulary to them. The basic Montessori math lessons start with the recognition of number and quantity, so children will learn how many objects correspond to a determined written number. As long as each child is ready, they will be introduced one by one to other lessons such as the decimal system, arithmetic tables, and geometry. Ancillary subjects improve the entire learning process of each child. Those lessons include Art, Music, Geography, Botany, Zoology and Science Experiments. They can either observe some project that the teacher is presenting or develop hands-on activities in different fields such as cultural, scientific, moving/dancing among many others. The most important purpose is for them to develop social, emotional and cognitive skills.